Hello Dice Masters Fans! The 5 week extravaganza has come to a close. The Weekly Dice Arena/Dice Masters North Achievement League is done (for now). Lots of dice were rolled over the weeks. Many achievements were… achieved. While I will not give you a week by week breakdown, I will give you the results and some stats if you are interested. If you want to read about the details of the league, you can check out the original article here. Character Based Challenges (where you had to build your team around a set list of specific characters). Building Based Challenges (where you were given Team Building restrictions). Win Based Challenges (where you had to win your game by meeting certain criteria). Gameplay Based Challenges (where you had to perform specific tasks during the course of a game). This created an overall challenge from week to week. Do you build your Team to win as much as possible? Do you build it to be laser focused on a specific task? Do you build it to check as many boxes as possible, while putting wins to the side? The players did all of the above over the past month. You can check out many of the matches on The Weekly Dice Arena YouTube Channel. Reg (from Dice Masters in the Great White North) is currently working on a write-up on his week to week experiences during the League. Read on below to see how the Achievement League finished. Let’s get the obvious thing out of the way… who won? Well, after 5 events, Reg was on top of the Leaderboard with 261 points. It was a tight race with Jay and Kim, who were close behind. A couple of Achievements either way and the results could have easily changed. Reg, Kim, and Jay all completed the most character based challenges giving them some easy points. White Tiger was the character that showed up the most, followed closely by the Foetid Bload-Drone, Joker, Absorbing Man, and Black Bolt. A few characters were never once used, leaving points on the table. Lots of players took advantage of the points available in this category. The most popular achievement was “Defeat your Opponent without doing more than 20 damage”, which was completed 7 times. “Win a game using only cards with blank text boxes” was only completed once and scored big points for Kim. This category was all over the place. The most completed challenge was to “Build a Team with only 8 dice (No Super Rares)”, which happened 6 times. The challenges that were completed the least amount of times were “Build a Team consisting of only Super Rare Cards” and “Build a Team consisting of only Organized Play Cards”. These were completed 2 times each. The challenge that topped the list here actually surprised me. Completed a total of 8 times, “Play an entire game where you Field every character that rolls a character face” was by far the most popular achievement. On the other side of the spectrum, Reg was the only player to complete the “Purchase all of your dice (must have a 20 dice Team, no Fabrication)” achievement. Since this was a crossover event, not everything qualified for our TOTM Leaderboard. I gave points out as normal for those that showed up to the TOTM specific night. I handed out League points as follows: Reg (10 points), Jay (9 points), Kim (8 points)… you get the idea. Zack and Jocelyn split points for being tied, which is why there is a half point on the Leaderboard. 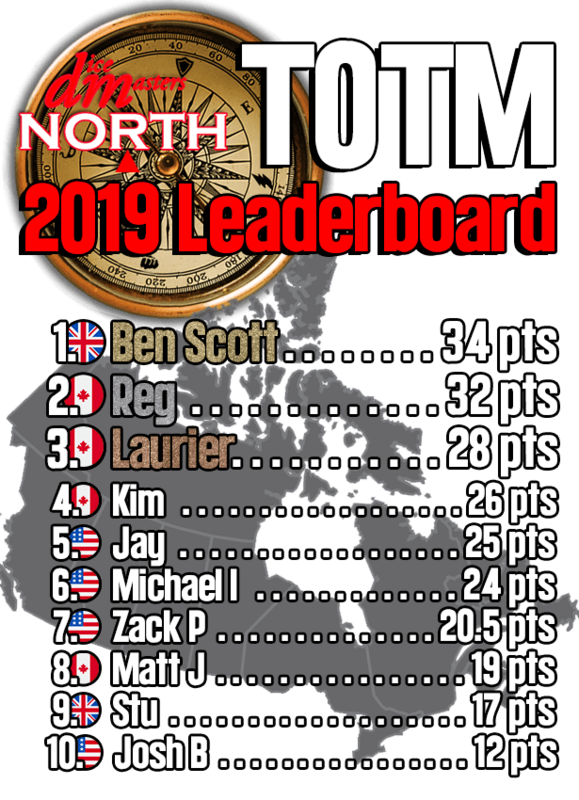 Ben is maintaining his grip on the top spot for now, but Reg rocketed up the standings thanks to his Achievement League points. Thank you to everyone who participated in this past month’s festivities. This was a great experience teaming up with Ross for a larger event. I hope we can do this again later in the year. On that note, I would like to get feedback from those who took part (or those who just watched). What achievements did you like? What didn’t you like? What would you like to see changed if this were to run again? Let us know in the comments below. Now, this is where I usually introduce the next TOTM. We normally run our events towards the end of the month. With April, we have a couple of issues with that. One is Easter Weekend. The other is the One Big Weekend Online Tournament. For those that do not know, visit Rollin’ Thunder to read up on the Tournament. We will be bowing out this month to put the focus on that event. We’ll have an announcement later this month for what we have planned for May. 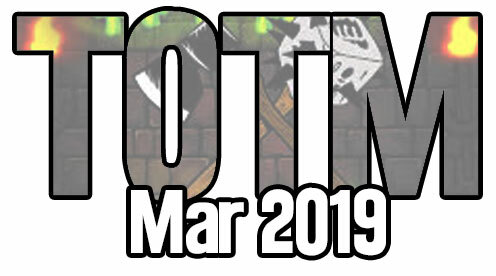 See you at the next TOTM in May!